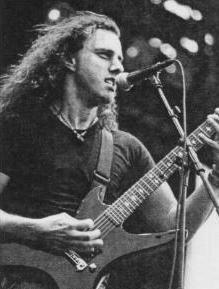 Chuck Schuldiner isn't just a legendary figure in the death metal scene, he is also the scene's most respected guitarist. Since Scream Bloody Gore came out twelve years ago, his growth and progression as a player has been amazing, improving with each album. Now, on The Sound Of Perseverance, Chuck, along with fellow axeman Shannon Hamm, have unleashed one of the most shredding, guitar oriented albums in recent years. Pit: You're one of the most respected guitarists in the scene, was it always a goal to get the acclaim as a player? 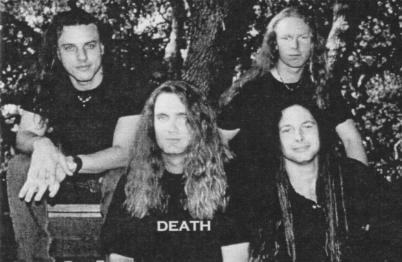 Chuck Schuldiner: Yes, I've always tried to get better and play better leads from album to album. I was lucky to start playing in the early '80s when so many great players were around to inspire me like Yngwie Malmsteen, VAN HALEN, and especially Dave Murray and Adrian Smith of IRON MAIDEN. Any current players inspire you? Just the guys from the '80s that are still around. I know it sounds like I'm stuck in the past, but I just don't like most of the music in the last decade. I could sit here all day naming players that I grew up on that inspired me, but very few players in the '90s interest me at all. Take John Petrucci from DREAM THEATER. He is a great technical player but his playing doesn't give me that feeling in my gut that I feel when I hear Dave Murray play. One of the only guys in the '90s to do something really great was Bill Steer from CARCASS on the Heartwork album: that playing had that magic rarely heard anymore. With every DEATH album I try to carry the torch of shredding and melodic guitar playing and I'm very proud of that. How do you feel about learning theory and reading music? I think that no theory is good theory. Nothing turns me off as much as some teacher or book telling you how you should play, and what's right and what's wrong. Theory takes the rock 'n roll out of playing, and you end up sounding mechanical because you're more concerned with watching your fingers play the correct scales than just letting go and playing what you feel in your gut. I have no desire to ever learn music theory. Did you ever try and take lessons? I took two lessons and he showed me "Mary Had A Little Lamb" and I said screw it and went on my own. I learned things from friends who played, and I picked things off records. I can remember trying to learn the riffs off EXCITER's Heavy Metal Maniac album, but I could only pick out some of it so I started coming up with my own songs. How do you keep your chops up? I don't practice 8 hours a day like some guys do. I've never thought it was good to sit in your room with a metronome doing finger exercises all day. I really just jam and try to come up with new melodic ideas and riffs. Let's talk about your equipment? Well, I really have a simple set up. I've been playing the B.C.Rich Stealth for years now. I have three of them, one is a custom black one that is my main stage guitar, one is an emerald green that is really beautiful, and an old one that I recently stripped down. They all have a fixed bridge and one Dimarzio X2N pickup which is a key to my sound. My amp is a Marshall Valvestate head and cabinet, that's about it. I don't use effects except for a little chorus on my leads, I really like a basic setup. Developing a good ear is the most important thing. Play things that inspire you, and don't learn things that bore you. If music theory interests you, then learn it, but don't feel you have to. It was my choice to not learn it, and I think I'm a better player now because I learned to play things my own way.